InSanity lurks Inside: Rumor- B&M Coasters create 5 Point Harness? 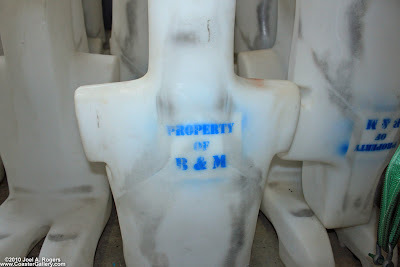 Rumor- B&M Coasters create 5 Point Harness? This image surfaced today out of the Silver Dollar City amusement park in Branson, Missouri. Please Note- I'm classing this as a "Rumor" simply because there is no real conformation of this project from either the Park or the Designer. Negative G reports that this new harness is something being testing by roller coaster giant, Bolliger-Mabillard. Early rumor states this is a new "5-Point Harness" which should allow amputees to ride on their coasters. Employees of Silver Dollar City also believe that Dollywood may be testing this system also. This would be surprising as Busch Gardens is normally the testing parks for B&M coasters in the United States. Another point which I've started to wonder about- Most B&M coasters feature a full shoulder harness with the exception of their hyper-coasters (a full circuit roller coaster without inversions and over 200 feet tall). Now if your still with me here, have you ever seen the "water dummies" they use to test roller coasters? Their rather weird to look at but notice one key part- They lack both arms and legs. 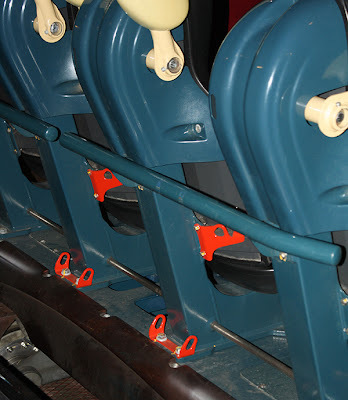 So, if you can test a standard B&M shoulder harness coaster with these I'm wondering why folks who've lost a limb have trouble riding? I get that on the lap-bar only coasters a problem could easily happen (and did) but wiggling out of a shoulder harness is damn near impossible unless your some kind of contortionist. Seriously, you can't get those off without the coaster having power or some heavy-duty power tools being involved. Even if your missing a single limb (be it arm or leg for whatever reason) I don't see why riding would be a problem nor why you would need a full 5-point harness. If the water dummies ride just fine, I'd think real people would be just fine? Granted, I'm not coaster designer nor do I have any kind of impressive engineering nor physics degree.. just a healthy dose of common sense. Either way, if this turns out to be true I'm very pleased that B&M is going the extra mile to make sure those who may be missing a limb will have extra safety precautions and will soon be able to enjoy the thrill of coaster riding.